Gluten-Free: Simply a Way to Healthier Eating? Foods, beverages and dietary habits remain at the center of consumer perceptions of health and wellness. How we think about and understand nutrition and our bodies is ever evolving as food literacy continues to grow. Food has increasingly become the language consumers use to both assess and express their wellness values. From a macro health and wellness perspective, consumers remain intensely focused on what they perceive as “better food” — the ideal of eating food that is real, fresh, minimally processed and higher quality. The consumer is now in control. Welcome to the dawn of customized wellness. Today’s consumers are personalizing their diets by adding foods that promote satiety and good digestion. In pursuit of this quest, consumers are adding ingredients like fiber, protein, vitamin D, whole grains, nuts and seeds, calcium and olive oil to their diets. 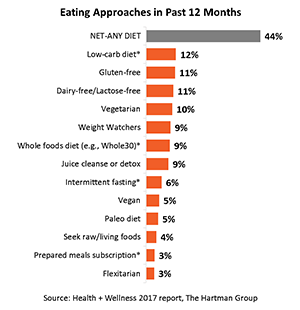 The Hartman Group’s Health + Wellness 2017 report finds that consumers are turning internally to their own bodily cues, starting with their digestion, to judge the healthfulness of foods. Good digestion is the root of all wellness and the key to feeling good. According to our Health + Wellness 2017 report, more consumers than ever are experimenting with their diet, and free-from diets are on the rise. 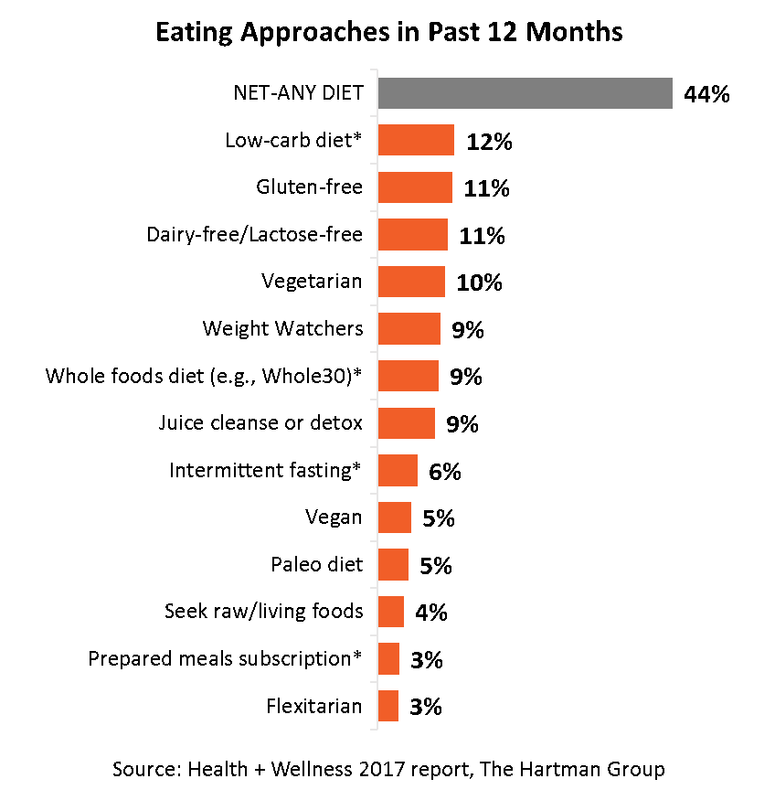 The following chart shows that close to half of consumers (44 percent) have experimented with some type of diet or eating approach in the past 12 months. 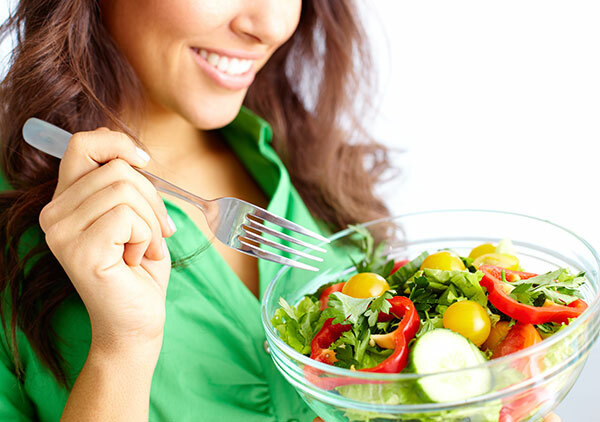 Consumers’ diet experiments reflect interest in supporting digestion. Interest in gluten-free has not waned. The desire to simply explore other ways of eating that may be healthier is particularly true of gluten-free purchasing. Consumers’ rationales for purchasing gluten-free products demonstrate that they do not mistakenly believe they have celiac disease. Instead, they associate gluten-containing foods with being high in carbohydrates, which they are often trying to avoid for a variety of reasons. Many also see foods that cater to dietary “restrictions” as offering a route to a more varied diet. Will the proliferation of “gluten-free” claims continue? Is this attribute an essential for brand growth? We hypothesize that there’s something deeper at play. It could be the case that it’s something the consumer is inferring about these products that is driving growth. For instance, “digestive health” or “inherent functionality” might be the real product attributes that are behind consumers’ decisions to buy. Not all attributes, obvious or implied, are equally important in all categories, so a category-specific lens is critical for accurate trends analysis. Health + Wellness 2017 updates and extends The Hartman Group’s previous work, showing changing attitudes, behaviors and emerging trends. We will also apply our signature ahead-of-the-curve thinking for marketing health and wellness solutions to consumers with our inclusive focus on trendsetters, early adopters and more mainstream consumers. The report delivers a culturally based, big-picture assessment of where health and wellness is today, where it is headed and what it means for your business.